When I heard that I could stitch stumpwork on my embroidery machine, one of my first thoughts was, “What’s stumpwork?” It’s not a technique I knew anything about, so – of course – I Googled it. Stumpwork is a type of three-dimensional embroidery in which design components such as flower petals and butterfly wings are stitched separately and edged with wire, then attached to the main motif. In addition, padding may be added under stitches to create dimension. 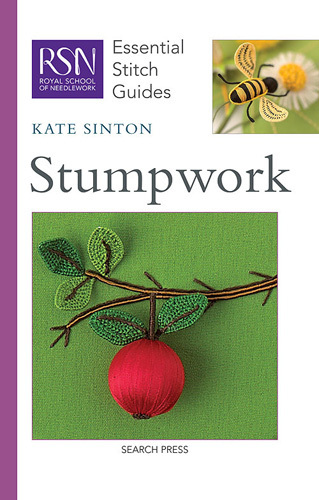 Examples of hand-crafted stumpwork are shown on the cover of Kate Sinton’s Stumpwork. The bee in the upper right corner alighting on a flower is an excellent example of this technique. 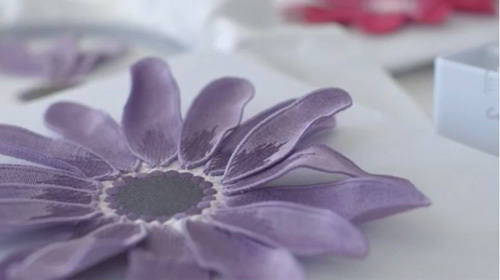 Watch the video to see the entire machine-stitched stumpwork process, from selecting and stitching individual wire-outlined components to assembling the completed motif. How do I make the link work? I am not able to copy it, nor is there a link embedded in it.